It can be easy to except the fact that the live sector is doing well from the figures shown in the previous blog (The Live Music Sector Part – 1) but to how much of an extent is that true? When thinking of live music venues doing well, from the thought of the live music sector performing well, most may think of venues like; The 02 Arena, Hammersmith Apollo, Wembley Arena, De Montfort Hall or Rock City. What people forget is that the live music sector involves small venues such as local pubs and clubs too. These small venues are shutting down. This is a bad sign for the live sound industry as these venues are the grassroots of the live music industry, where unknown bands make their name and gain a reputation to becoming popular and successful. The ‘Toilet-Circuit’ is a network of small music venues in the UK where indie, rock and metal bands visit to gain support and make their name. Famous bands have come from playing at venues in the toilet circuit including: Arctic Monkeys, Coldplay, Blur, Pulp, Radiohead, The Killers, Primal Scream and The Libertines. The Toilet Circuit venues have been hosting live music for decades but in recent years, many have been or are being forced to close down including venues such as; The Buffalo Bar in Islington, the 200 Club in Newport, The Freebutt in Brighton, the Kazimier Bar in Liverpool and Nation also situated in Liverpool. 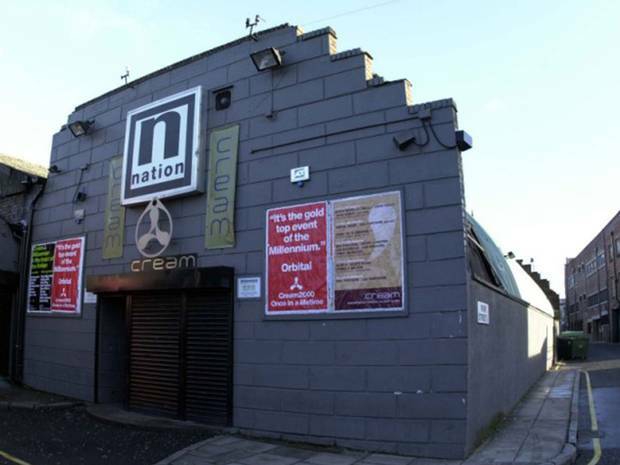 Nation in Liverpool – one of the many toilet venues looking to be closed down. It can be quite disheartening to find out old well-known music venues are no longer running because of some noise complaints because the government have decided to build a block of flats next to or above them. What needs to be realised is that if the small venues start closing down then there will be less bands being seen, which would mean less exposure, which would mean less break through acts. Without small venues, there would be less chance of a start to the process of bands making it to venues like the 02 or Brixton Academy or playing at festivals like Glastonbury, which make up a large percentage of the live music revenue. If the live music sector is to keep on growing then the government needs to realise that the small venues are the grassroots of the live music industry and without them the live music industry may soon decline. This is the first of two blog posts that will show how the live music sector performed in the year of 2013 and comparing it to 2012. The information that is used is from the UK Music, Measuring Music – September 2014 report. 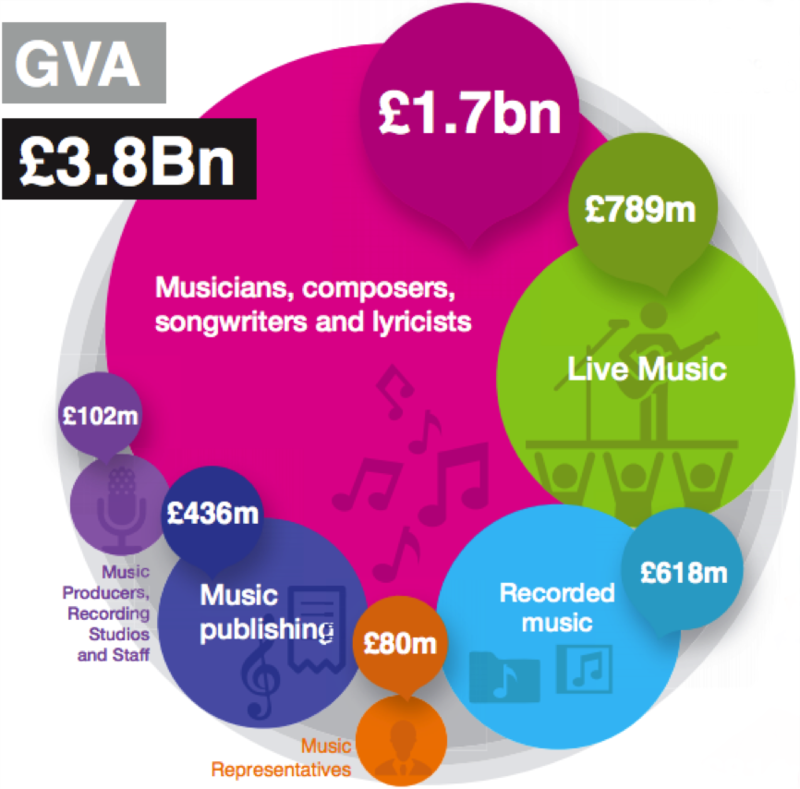 As a whole, the music industry did well in 2013, with the industry producing £3.8 billion in GVA (Gross Value Added) as well as creating 111,000 jobs. From the report, it shows that the live music sector was the second biggest contribution to the core music industry. It made £789 million in GVA compared to the recorded music sector, which made £618 million, as well as the sector of music producers, recording studios and staff, which made £102 million. The employment FTE (Full-time equivalent) of the Live Music sector was 21,600 in comparison to recorded music with 8,510 and music producers with 9,600. On top of being the second biggest contribution to the core music industry, the live music sector showed a growth of 26% in office taking, compared to the year before. This shows how important the live sector of the music industry is, with the increasing amounts of illegal downloading causing falling revenue to the recording industry.